I am an active duty Air Force officer investing for financial independence by age 40. Financial Independence Calculators – Are We on Track? These are my top recommended credit cards for this month. Let me show you how to get the $450-550 annual fees waived exclusively for US military personnel in my five day, 100% free course. Military Money Manual has partnered with CardRatings for our coverage of credit card products. Military Money Manual and CardRatings may receive a commission from card issuers. Opinions, reviews, analyses & recommendations are the author’s alone, and have not been reviewed, endorsed or approved by any of these entities. Thank you for supporting my independent, veteran owned site. In this article I run my personal financial independence plan through several online retirement calculators. Every calculator is only as good as the assumptions that go into it. Some calculators run “Monte Carlo” scenarios in which they run thousands of possible outcomes (high inflation, low returns, bonds perform better than stocks, etc.). Some calculators use historical data like the annualized returns including dividends of the S&P 500 since 1871. Whatever their source and methods, it’s good to get a second opinion on your financial independence plans. Remember though: all calculators are inherently wrong. Why? They cannot predict the future. While I’m sure the future will look similar to the past, it probably will not repeat it exactly. Yes, there will be bear and bull markets and I guarantee at least one 20-50% crash in the next ten years. However, I also believe that if the market can survive through World War I, the Roaring 20s, the 1929 stock market crash, the Great Depression, World War II, the boom years of the 50s, the Stagflation of the 70s, the Reaganonomics of the 80s, the dotcom boom and bust of the 90s, the terrorism and eternal war of the 00s, and the 2008 mortgage backed securities bust and collapse of the housing market, then we can probably make it through whatever comes next. The four online retirement calculators I used were the Personal Capital Retirement Planner, the Betterment Retire Guide, the FIRE Calc, and C FIRE Sim. (FIRE = “Financial Independence/Retire Early”). My assumptions were 3% inflation rate, 95% stocks/5% bonds asset allocation, 0.10% expense ratio, and saving $42,000/year between now and age 40. In retirement I plan to withdraw $40,000/year to live on. The Personal Capital Retirement Planner is an excellent Monte Carlo simulator for analyzing your financial independence goals. It runs 5000 simulations and displays the median and 10th percentile outcome (meaning 90% of outcomes were better). You can add additional income, life events, pensions, and Social Security estimates as well. It takes a snapshot of your current net worth and asset allocation at the moment you run the tool. A very useful and accurate tool to analyze your current portfolio! In this scenario I put in my assumptions as listed above. Based on the simulations run by the Retirement Planner, I have a 62% chance of my FI investment plan getting me to my death with money still in the bank. While those aren't the best odds, it shows me that I'm moving in the right direction. By increasing my average annual savings, working a few extra years, or by finding additional income sources in retirement (whether it's an AirBnB rental property or a part time job driving for Uber), I feel confident that I can have much more freedom with where and when I spend my time. Even if I miss my goal of financial independence by age 40, I will be within a year or two of achieving it. At that point, any additional years I work will just be adding to my lifestyle or travel opportunities. Betterment's RetireGuide showed me similar information to Personal Capital. Rather than giving me a fixed percentage chance that my plan would make it, Betterment recommends an annual savings goal. In this case, they recommend saving $63,960 per year to reach a $40,000 per year spending by age 40. Investing $64,000/year is aggressive but should certainly be attainable by a married couple each making $60,000+/year. Currently we're only saving $42,000/year so we will need to ramp it up. I have a time in service pay raise coming up this year. If I can get some extra TDYs or some tax free CZTE income, I may be able to get close to $50,000 for 2016. 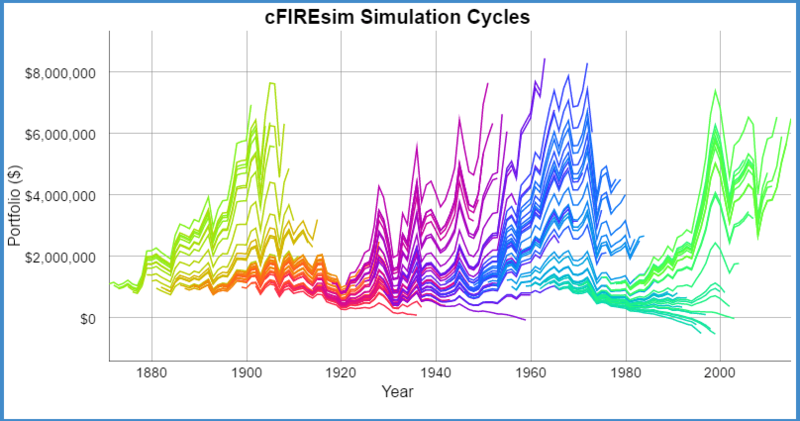 FIRE Calc requires no sign up and runs simulations on historical data. It starts in 1871 and asks “what would have happened if you retired in 1871 and died X years later?” You supply the assumptions, it crunches the data based on available information. Here's a link to my numbers. You can see that if I retire 12 years from now at age 40 and live an additional 40 years in retirement, the probability of success (meaning the portfolio did not go below zero before I died) is around 80%. Again, this a great confidence booster. Any probability above 80% is probably overly confident but it's good to see that my plan works 4 out of 5 times. To prevent the worst case scenario from happening, delaying exiting the workforce or finding additional income sources can definitely increase my chances for success. I would like to think that I'm a pretty resourceful individual and if my portfolio took a big hit in the first decade of my financial independence, I would work towards rebuilding it and trying again. It's not like you lose the ability to work and produce income when you become FI. In fact, because you're freed from the 9-5 desk job you can now explore more creative and fulfilling opportunities. CFireSim is similar to FIRECalc. Put in your assumptions and off you go. Based on the back testing cFIRESim did, I have an 80% of success. At retirement, saving $42,000/year, the data predicted an average retirement account of $1 million. Two of the back testing calculators agree with around an 80% chance of success. Personal Capital‘s Monte Carlo simulations seem to suggest a lower chance of success at around 62%. 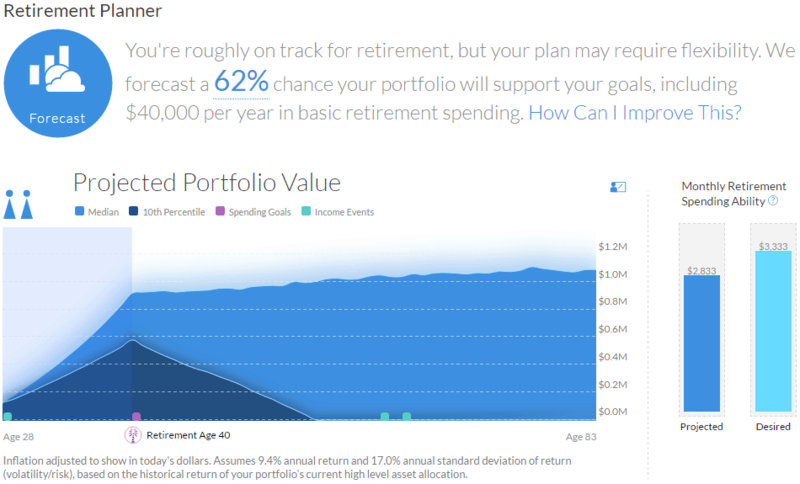 Betterment thinks I should bump my savings up by $20,000 per year for a better chance at achieving my early financial independence goals. My takeaway from running these calculators is that I still have some substantial savings to do. I believe that my goal of FI by age 40 is still realistic and attainable. Even if I miss it by a year or two or I'm a few hundred thousand dollars short, just having a substantial FI fund will make life much easier and less stressful. The number one thing you can control when it comes to investments is your savings rate. Performance is usually outside your control, so focus on setting a good risk/return balanced asset allocation and move that savings rate as high as you can (see graph below). When you start saving 50%+ of your income, your years to work until FI falls below 20. This makes FI a much more attainable goal. 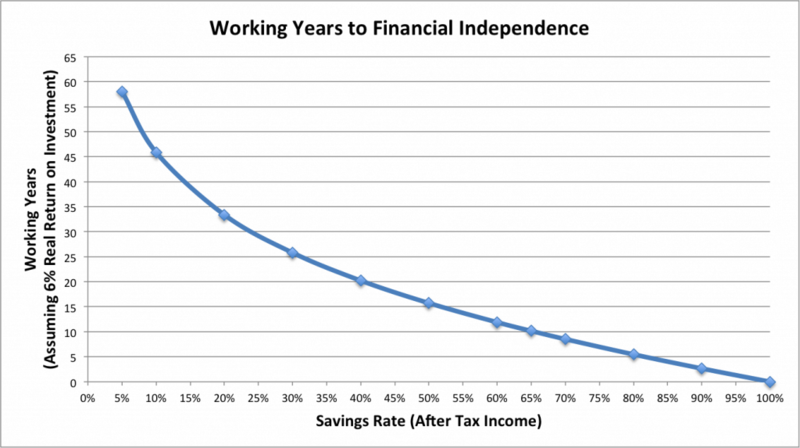 Savings rate vs. years to work until financial independence from GoCurryCracker! I sense there is a problem using historical returns. For a long time they were reasonable, however, economic growth has slowed, and probably not temporarily. Globalization, population growth, and technology are not working in our favor. Globalization outsourced a lot of jobs. That left more people pursuing fewer jobs, so wages have been falling. Population growth has slowed in all developed nations. Economies grow because more people borrow and spend more, not because of some smart politician. Technology is now starting to replace a lot of workers, instead of making them more productive. Self-driving trucks are already on the road, in their testing phase. If economic growth is going to be slow, corporate earnings growth will also be slow. So, stocks will not provide historical returns. Most portfolio return simulators use historical returns. So, they will be overly optimistic. Sign up here for the 5 day Ultimate Military Credit Cards Course! Microsoft Office Military Discount only $14.95! Copyright © 2019 Military Money Manual.